When I was in junior high, I hated school. I hated being in my skin. I reached my current height of six feet right around eighth grade. It was not a source of pride. But beginning in seventh grade, I had a Happy Place, and that place was French class. I loved my textbook and its little cartoons and dialogues and photos of Paris and the countryside. The language came to me almost effortlessly. And I loved the poems in the textbook, which we could memorize and declaim in class for extra credit. 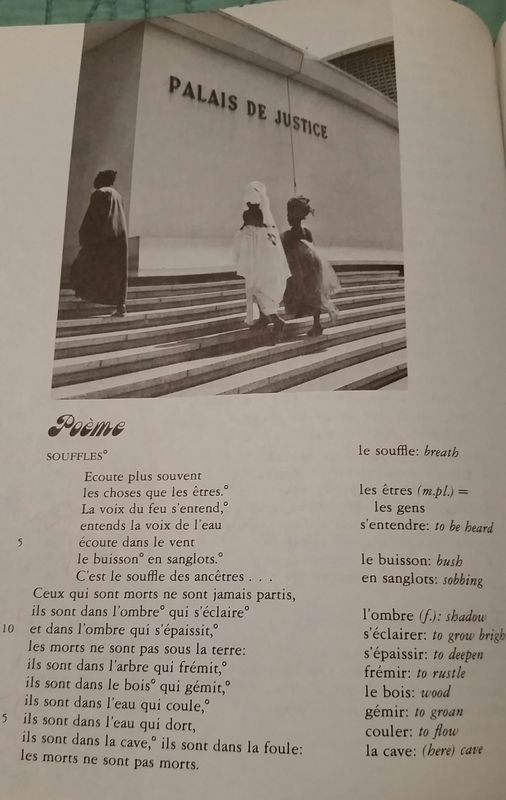 My textbook in eighth or ninth grade, Scènes et Séjours, included a poem somewhere in the middle of the book that spoke to me with its incantatory vibe and authoritative tone. I was just starting to discover poetry, and this one really intrigued me. There was no biographical note about the author. 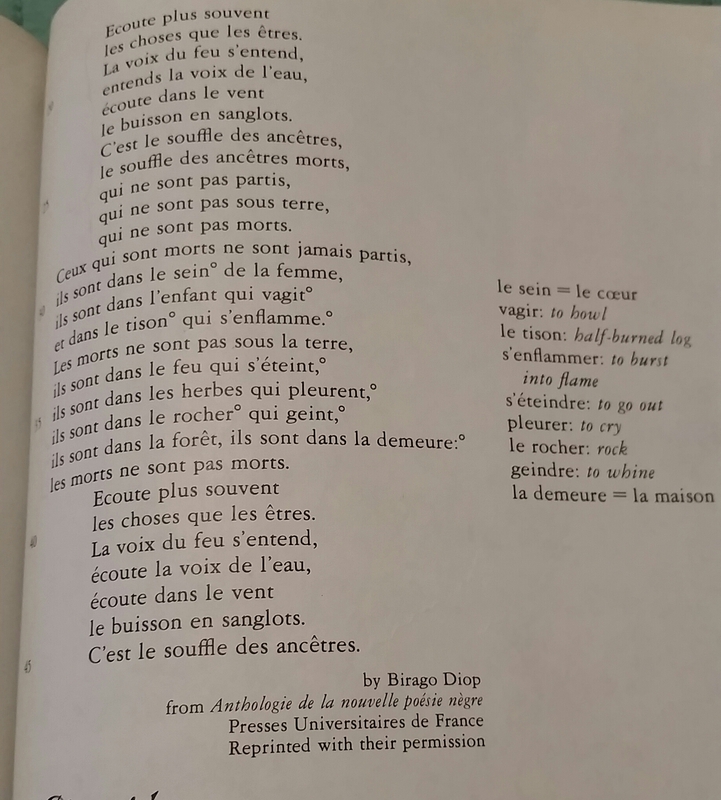 There was just the poem, and my assumption that the author came from Francophone Africa. I loved the poem so much, I not only memorized it — I also, at the end of the school year, bought my copy of the textbook. I have toted it around with me ever since, even to college, where as a French and Italian major, I mostly had no actual textbooks, just small, obscenely expensive imported paperbacks of novels to read, or sheaves of photocopied poetry or plays or literary criticism hand-selected by my professors. An English version (one of many that can be found online) is here. Birago Diop was a Senegalese writer, veterinarian, and diplomat, whose childhood was steeped in folktales told by griots. As a writer, he became affiliated with the Négritude movement. One analysis of this poem emphasizes its source in Animism, the belief that there are souls not only in living things, but in all things — and that there is no separation between the spiritual and material worlds. No surprise, then, that this poem has resurfaced precisely now, bobbing like a cork in my mind as I begin to make my way out of the initial shock of my father’s death and into the unfamiliar process of situating this loss within everyday life. Since losing my father, many things have been revealed to me about the way the departed make their presence known in the world. Not just the Velcro I spoke of in my previous post, and not just the glimpses of the many other things my father loved popping up where I least expect them. I find I have new ways to interact with people I may have known for a long time, who dealt with the loss of a parent before I did, and who now welcome me to the (admittedly sad) club. We can talk about things, find points of intersection, and muse about how well our fathers might have gotten along. There have also been unexpected communications from beyond, mediated by people my father might not even have bothered to speak to while he was alive. This week, I found myself unexpectedly in receipt of such a message from my father, transcribed by someone who was a stranger to him, someone I have known casually for a long time, someone for whom communication with the dead is a normal occurrence. I wanted to believe it was a put-on, and “Princess” nearly threw me off. Who can wrap their head around their dead father reaching out in this way, and in such unfamiliar handwriting? What the person who mediated this communication did not know was that this particular week,as I headed in for my next brain MRI, I’d really need that sort of reassurance, whether or not it was actually from my dad. My anxiety this time was tempered by grief, but it was still there. My continued health is not a foregone conclusion. But I have outlived my father, which at several points might have been a less certain thing. I wouldn’t say this gives me a sense of comfort, really. It is just one less thing I have to dwell on. Yesterday morning, I went for my scan. Today, I saw Nurse Practitioner Rajni, who told me right away that my MRI looked just fine. I told her my father was dead, which was news to her, because the last she’d heard, I was headed down to see him (and asking what to do about taking my medication that needs refrigerating). I narrated his final days for her, and each time I do this for someone feels like a bandage being ripped off, a wound reopening. Being back in a medical setting was not easy, neither yesterday at the MRI facility (where I was largely okay, except for a brief moment when the technician placed my IV and my vein collapsed and she had to start over, and I thought of the many times in the hospital that my father was stuck), nor today, when Nelson, my favorite technician at Dr P’s office, consoled me as I cried while he took my vitals. He too was on the verge of tears, telling me about losing his father to cancer four years ago. Last night before going to sleep, I realized this would be the first time I’d get scan results and not be able to call my dad to tell him. (I dissolved into tears, of course.) This morning as I was rushing to my appointment, I saw my father’s plaid shirt draped over a chair and knew I’d need to wear it. My father’s shirt was there with me, getting the news. In the past three weeks, I have tuned in to things (choses), and also to beings (êtres). And I think I might have learned the lesson that this poem implanted in my head so long ago: Les morts ne sont pas morts. My father passed away just after midnight on February 1. He had turned 82 years old on January 30. We buried him today. Friends who have been through the loss of a parent told me to be alert to signs or messages from my departed dad. They were there, in the heron I spied by a pond as our procession drove by; in the traffic on the highway; and even in the completely random appearance at the cemetery of a piece of Velcro that stubbornly stuck to my glove (I had always associated my dad with Velcro because he is the one who first showed it to me, and he used it for many things). I’ll have a lot more to say about my father in coming weeks. For now, I’ll just say, I miss you, Pa.